Windows 10 Quick Assist is a new remote technology provided by Microsoft at no charge with later versions of Windows 10. 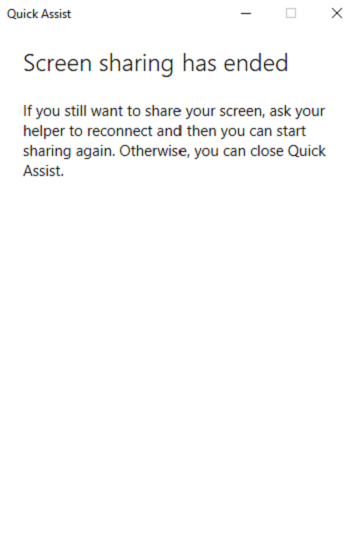 The main function of Windows 10 Quick Assist is to provide a means of Desktop Sharing or Screen Sharing through an internet connection allowing a Helper to assist a Screen Sharing computer requesting assistance. Quick Assist cannot be used by earlier Microsoft operating systems like Windows 7 or Windows 8, or Windows 10 versions earlier than the Windows 10 Anniversary Update (Version 1607) released August 2, 2016. This remote technology builds on the capabilities of the earlier Remote Assistance application that was introduced with Windows XP. There are significant advancements in Windows 10 Quick Assist versus Microsoft Remote Assistance. With Remote Assistance the individual being helped needed to generate an invitation file and then email that file to the helper. Also, with Remote Assistance, there was a dependency on ports being open on a Firewall which worked well in many SOHO (Small Office Home Office) scenarios but not all. For Remote Assistance these ports were typically opened dynamically on the border router by a technology called UPnP (Universal Plug and Play) not always available or configured on the SOHO router/firewall. With Widows 10 Quick Assist, neither of these complications apply and the Helper and the Helped invididuals only need to launch the Quick Assist application on their respective computers and then the Helper provides the Helped individual a 6 digit key to enter into the Helped individuals computer. The two computers are now able to connect where the Helper can view and optionally control the desktop of the Helped individual including dual monitors. During the Quick Assist session the Helper and Screen Sharer (Helped) individuals should be connected by phone. 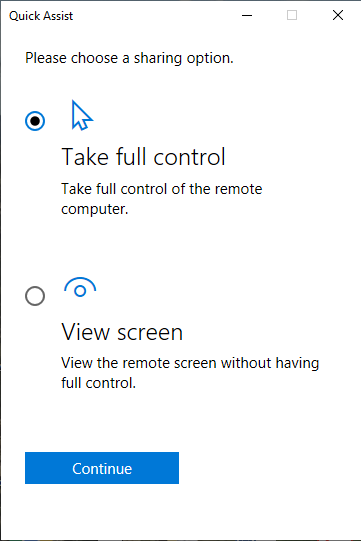 One limitation of Windows 10 Quick Assist is that both the Helper and the Screen Sharer (Helped) invididuals must be at their respective computers to start the Screen Sharing session. 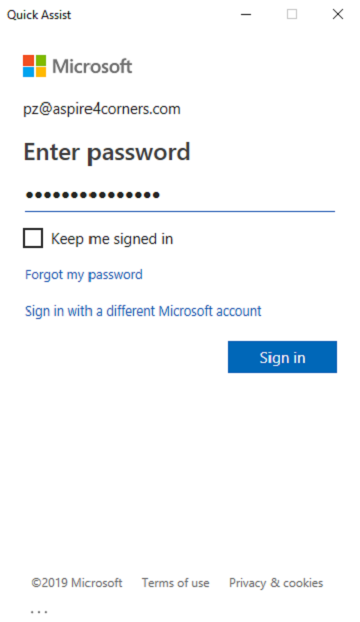 Windows 10 Quick Assist does not provide the capability for the Helper to log in remotely without someone on the other end launching Microsoft Windows 10 Quick Assist, entering the security code and then granting permission, so, from the Helper's perspective, it is not an On Demand application. Microsoft Windows 10 Quick Assist can be used for a 'live' demonstration by Aspire of either CoffeeRoaster Software or FishWare Software. For this to work the screen sharer will be Aspire, thus the person viewing the Screen for a Demo assumes the role of the Helper. In the Helper role you must log on with a Microsoft Account before you can provide the security code to the screen sharer (Aspire). With the link below you can either Sign In to an existing Microsoft Account or create a new one. A Microsoft Account can be used to make purchases from the Microsoft Store, manage an Office365 subscription or Sign into Skype. 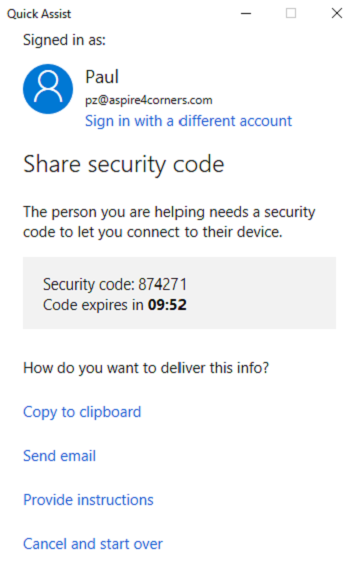 The person providing assistance must sign in with a Microsoft account and then obtain a 6 digit code that will be provided to the person sharing their screen (Helped person). 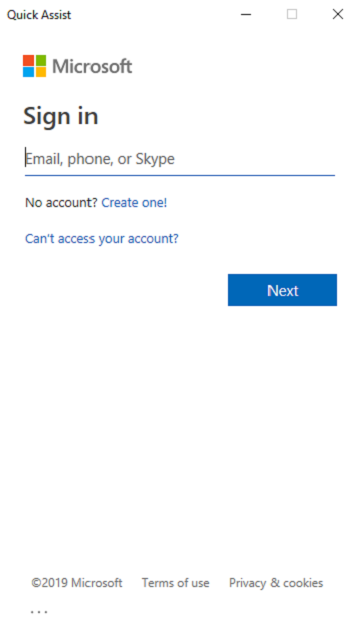 The sign in to a Microsoft Account may be several steps as shown below. As the 'Helper' your role is to privide assistance, click on the 'Assist another person' button. The Helper must sign into Microsoft by providing the credentials for a valid Microsoft Account. For FishWare and CoffeeRoaster owners you should already have a Microsoft Account that is used to manage an Office365 subscription. This account would work or if you have another valid Microsoft Account you can use that account as well. Enter the user name credential for a valid Microsoft Account in the form below. 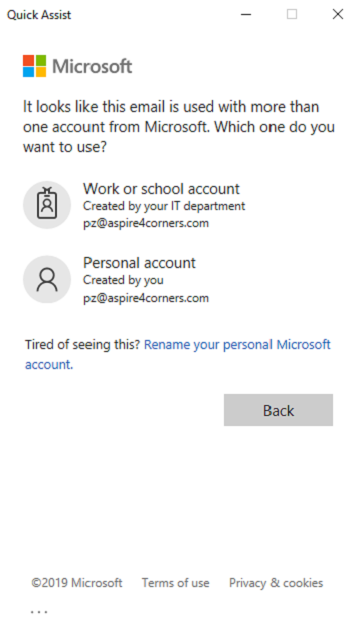 If you have more than 1 Microsoft Account attached to a specific Email address you will need to choose between a Work or Personal Account as shown below. After your helper signs in they will be provided a Security Code shown on the Right column for the 'Helper'. They will provide the code to you, preferrably by phone and you enter it into the form below allowing the two computers to connect. After entering the code click on the 'Share Screen' button. The codes must match on both machines. 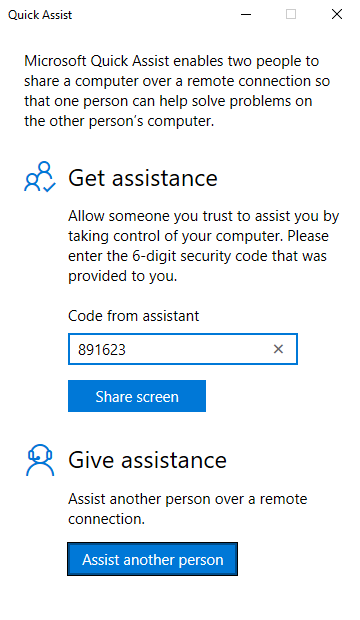 After successfully logging in with a Microsoft Account you will be provided a 6 digit code as shown below that you provide to the person being helped. 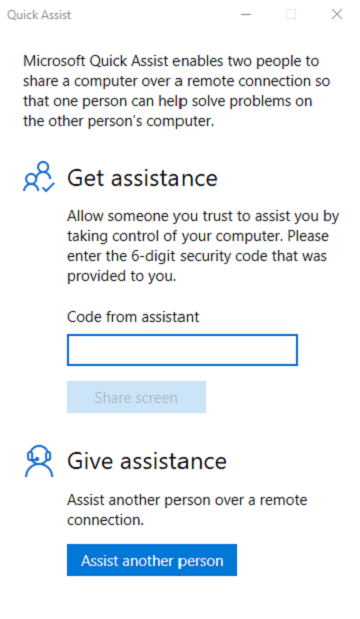 The person being helped must enter this code into Windows 10 Quick Assist as shown in step 1 above. By default the code has a longevity of 10 minutes before timing out. The 'Helper' can request full control of the remote computer enabling the helper to manipulate the mouse and keyboard to make necessary changes. Before the 'Helper' can gain control the person sharing their screen must provide permission. After entering the code for the two macines to connect, the Helper wil request to 'Take Full Control' or View your screen. 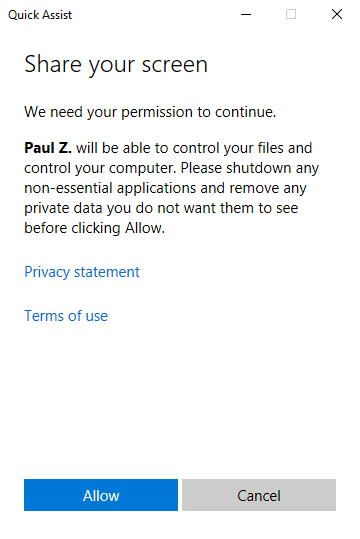 You must provide permission as shown below before the Helper can view or control your screen as shown below. To Share your screen click on the 'Allow' button below. During the Session a small box will appear on your screen as shown below. When it is time to end the screen sharing session close the connection. The following dialog box will display. 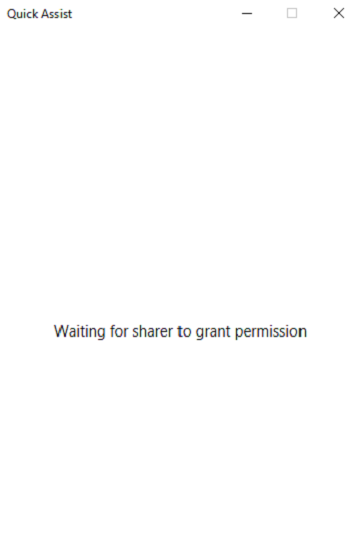 Waiting for sharer to grant permission to View or Control their screen. 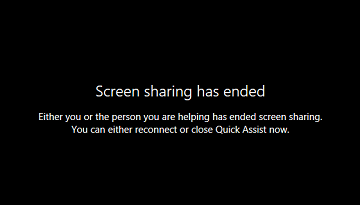 Screen Sharing has ended. You will see the confirmation as shown below. The screen sharing session has been ended either by the Screen Sharer (Helped) or the 'Helper'.